Introduction Solid pseudopapillary neoplasm is a rare pancreatic tumor which arises from exocrine type cells and has specific progesterone receptors. It was described by American pathologist Virginia Kneeland Frantz in 1959. Solid pseudopapillary neoplasms compose less than 1% of exocrine tumors of the pancreas. At this time there are only 3725 cases published in the world literature. Material and methods retrospective study of treatment results 37 patients with pancreatic solid pseudopapillary neoplasms was performed. All of them were operated in â1 abdominal department A.V. Vishnevsky Institute of surgery, Moscow, Russia for the period 2007 - 2017 years. Data presented as median (Me) with interquartile range 25% and 75%. Results majority of patients were females - 34 (92%), there were only three males. Average age was 34 (25; 42) years. In 17 (46%) cases there were pancreatic head tumor, 8 (22%) patients had an SPN in the body and 12 (32%) in the tail of the pancreas. Mean tumor diameter composed 42 (26; 73) mm. 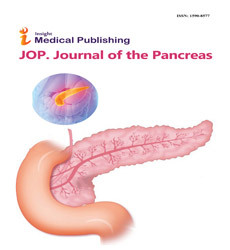 pancreaticoduodenectomy was performed in 14 (38%) cases, distal pancreatectomy in 16 (43%), in 7 (20%) cases organ - preserving surgeries were performed. There were 7 cases (19%) of clinically relevant postoperative pancreatic fistula. Postpancreatecomy hemorrhage type C has occurred in three cases, all of them were stopped by endovascular procedure. Mortality rate was 1 (2.7%) in case of female with severe postoperative pancreatitis with respiratory distress - syndrome. Conclusion surgical procedure has a great importance and primary relevance in treatment of solid pseudopapillary neoplasm of the pancreas, even in metastatic cases. Benign solid pseudopapillary neoplasms have to be operated using minimal invasive technology and with organ preservation. Immunohystochemical specimen examination has to be performed in all cases. Investigation of epidemiology and occurrence of this tumor requires collaboration involving the entire scientific world. Solid pseudopapillary neoplasm (SPN, SPT) – is a rare pancreatic tumor which arises from exocrine type cells and has a specific progesterone receptors. It was described by American pathologist Virginia Kneeland Frantz in 1959 . SPN has different names such as solid pseudopapillary tumor, Frantz tumor or Hamoudi tumor. SPNs compose less than 1% of exocrine tumors of the pancreas. According the data of National Health Institute of USA there were 2744 cases of SPN published in 484 articles in the world literature for period 1961- 2012. Most of them are presented as a case reports or series of several cases [2, 3]. At the present time SPN still stays a rare and difficult pancreatic tumor for efficient preoperative diagnostics, surgical treatment and adequate postoperative morphological verification. In this paper we describe diagnostic features and surgical techniques for patients with SPN based on our experience of 37 cases. Retrospective analysis of medical records for period 2007 – 2017 was performed in Abdominal Department No.1 A.V. Vishnevsky Institute of Surgery, Moscow, Russia. It was found 38 morphologically confirmed cases of SPNs. Surgical treatment has been performed in 37 cases; one patient without operative management was excluded from our study. Sample-size calculation was not necessary because we have not planed any comparison in this study. All recorded data of population were analyzed according the Intentionto- treat method. Dichotomous variables were recorded as absolute frequencies (number of cases) and relative frequencies (percentages). Data were presented as median and interquartile range (IQR) 25% and 75% if not indicated otherwise. Absolute majority of patients were female – 34 (92%) cases, there were only 3 (8%) male with confirmed SPNs. Mean average age of patients was 34 (25; 42) years. Preoperative anthropometric estimation included also body mass index (BMI), ASA risk score stratification, complications and comorbidities. Information about demographic and anthropometric status is shown in Table 1. The most of SPN cases became an accident finding during prophylactic checkup or examination because of comorbidities. Clinically most common symptoms were weakness or minimal nagging pain, rarely - nausea or even palpated hard growth (Table 2). Preoperative diagnostic included transcutaneous abdominal ultrasound (US), computed tomography (CT) with obligatory intravenous contrast infusion, magnetic resonance imagination (MRI) and endoscopic ultrasound (EUS). Preoperative gastroscopy was routinely performed in all cases. 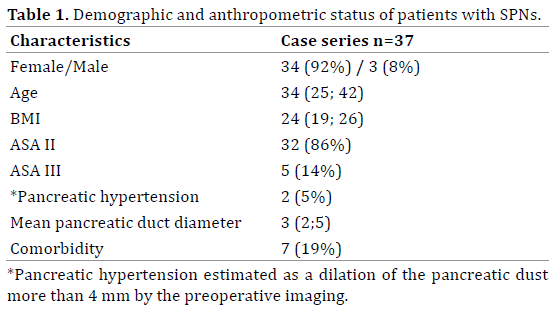 Quantity and percentage of diagnostic procedures measured. In difficult cases ultrasound guided fine-needle aspiration biopsy was performed. There were no special laboratory tests such as Chromogranin A, CA 19-9, CEA or α-FP performed during preoperative diagnostic step. Preoperative instrumental examination showed that frequently tumor was located in proximal part of the pancreas, rarely – in pancreatic body and tail. Mean tumor diameter was 42 (26; 73) mm. At the CT or MRI scans SPNs looked like a solid round hyper – or isodense tumor without pancreatic hypertension in most (95%) of cases (Figure 1). Figure 1. Preoperative MRI of SPN located in pancreatic body. (a). MRI scan, axillar projection, (b). MRCP scan. After preoperative examination in 37 patients underwent surgical treatment. All types of pancreatic resections including standard and organ-preserving procedures were performed. Type of resection depended of tumor location, diameter and size of extra-pancreatic component. Most of patients (78%) were operated conventionally. In 8 (22%) cases procedure was realized using robotic complex DaVinci S.
Most of all (81%), there were standard pancreatic resections such as pancreaticoduodenectomy (PD) or distal pancreatectomy (DP). Rarely, it were organ– preserving procedures such as tumor enucleation (TE) or median resection (ME) (Table 3). Indications for TE were benign presence of tumor without loco-regional or distant metastasis, more than 75% of extrapancreatic tumor component and more than 3 mm distance from pancreatic duct. MR was performed for intraparenchimatously located pancreatic body tumors. During PD or DP standard lymphadenectomy D2 was made with median lymph node harvests 18 and 17 respectively. While organ-preserving procedures normally lymphadenectomy was not necessary. DP with spleen preservation was preferred and performed in 13 (81%) of all DPs. 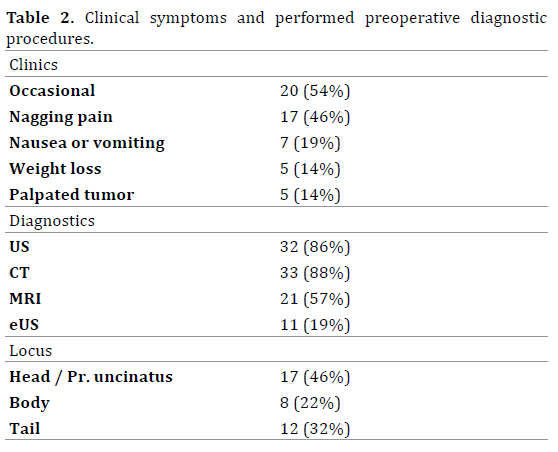 Postoperative specific complications were typical for pancreatic surgery. They were classified according to ISGPS classification [4, 5, 6]. Most frequently it was type B pancreatic fistula. There were no Type C fistulas. Mortality rate was 1 (3%) of all performed surgeries. It was young woman with severe postoperative necrotising pancreatitis and respiratory distress syndrome. In Table 3 demonstrated details of intraoperative data and postoperative complications. The tissues were dissected and fixed in 10% formalin (Fisher Scientific). The tissues were then embedded in paraffin, and serial tissue sections were made at five μm thickness. Immunohistochemistry (IHC) was performed in cut sections of pancreatic tumors using Synaptophysin, Cr A, PR, beta-catenin, CD99, CK 8/18 using the immunoperoxidase method. Antigen retrieval was performed using CC1 antigen retrieval buffer (pH 8.5, EDTA, 100°C, 30 minutes; Ventana) for all sections. Following incubation with the primary antibodies (37°C, 32 minutes) in phosphate buffered saline, pH 7.4 (PBS) with 1% bovine serum albumin (BSA), sections were stained on a Benchmark XT automated slide stainer using a diaminobenzidine detection kit (UltraView DAB, Ventana). Frozen section of resection margin was performed during all procedures. Pancreatic resection margins were tumor free (R0) in all cases. Morphological examination of specimens was routinely performed. In 27 (73%) cases diagnosis of SPN was confirmed with immunohystochemical analysis (IHC), otherwise by electronic microscopy. Morphological specimen examination found out that most of tumors were benign (G1), rarely it were grade 2 neoplasms. In two cases lymph node metastasis were diagnosed and only in one case there was confirmed liver metastasis. Unfortunately in these cases IHC wasn’t performed, so proper tumor grade wasn`t verified. 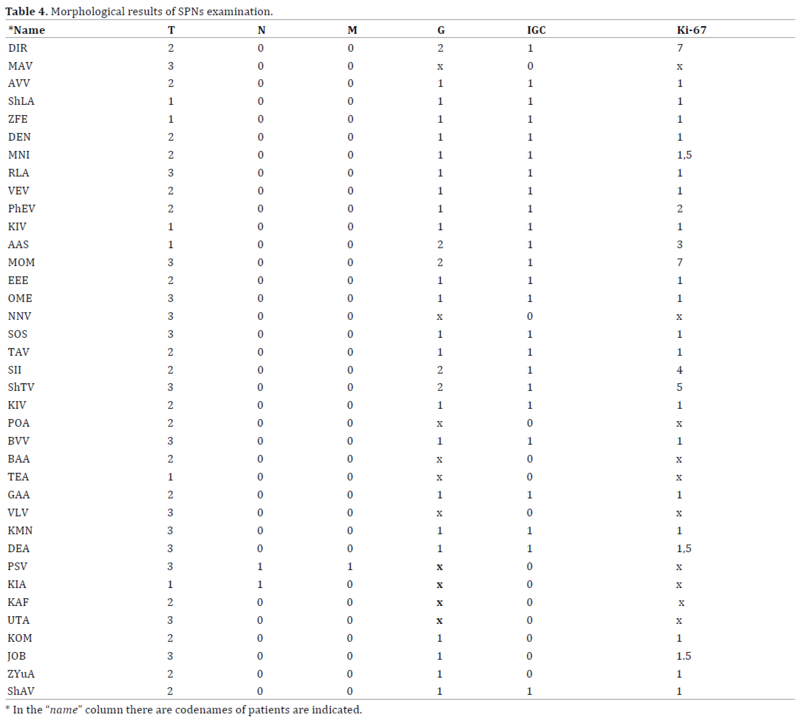 Morphological characteristics with TNM data, grade and Ki-67 index of tumors measured in Table 4. SPN still stays rare uncommon pancreatic neoplasm. From the date of its official description until 2012 there were only 2744 cases of this tumor revealed in the world literature [2, 3]. Found papers included 484 publications; most of them were presented as a case report or series of several cases. From 2012 till present days several large single- and multicentre studies of SPN surgical treatment were published [3, 7, 8, 9, 10, 11, 12, 13, 14, 15, 16, 17, 18, 19]. After detailed literature review we revealed 3725 cases of confirmed SPNs in adult persons including our experience (Table 5). Most of recent studies were presented from large clinics and research centres, especially from China. In our opinion, explanation of this can be the concentration of pancreatic surgery in multidisciplinary centres, adequate and contemporary diagnostic verification. In Figure 1 we accommodated all found case series with more than 3 cases including not only single centre experience but also multicentre collaborations and literature reviews. At the same time we excluded earlier publications from the same centres, which repeat cases cohorts. Basing on our experience, we suggested that it will be increasing prevalence of SPNs from year to year. But analysis didn’t show significant deviation and didn’t depend of progression in learning curve of our department (Figure 2). Moreover, there were periods of time with minimal detection of this tumor with twice lower grade than the median value (Figure 2). It can be explained by increasing quantity of high-volume pancreatic centres and the rareness of this tumor. Figure 2. 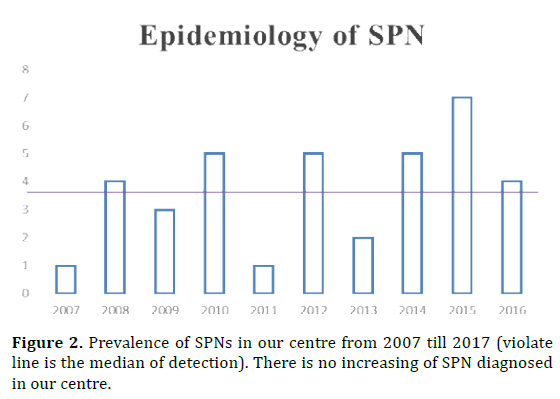 Prevalence of SPNs in our centre from 2007 till 2017 (violate line is the median of detection). There is no increasing of SPN diagnosed in our centre. SPN mostly occurs in young women under 35 years [3, 15, 16]. There are no specific symptoms of this tumor that’s why it can be frequently found during follow- up examination or treatment because of comorbid disease. Unlike of ductal adenocarcinoma it hasn’t invasive growth and doesn’t develop pancreatic hypertension, parenchyma atrophy or diabetes . Considering the fact that SPN is a very rare tumor and there are less than four thousand adult cases described in the world literature, it’s very difficult to understand epidemiology and predictive growing factors of this tumor. It`s definitely clear, that SPN has a specific progesterone receptors so young women are the main risk group for this disease. Moreover, it could be interesting to investigate epidemiological features and predictive factors of occurrence SPN in male cases. We hope that described step-by-step diagnostics, surgical treatment and morphological verification of SPN based on our experience can become not only a guide for management this group of patients but it can become a start to deeper epidemiologic and survival analysis all over the world. We think in that regard it’s more important to publish single centres experience than collaborations between different centres in one country even worse several countries on different continents. And definitely clear that research centres which are interested and have an experience in described problem could work together to understand the nature of disease and may be at some point absolutely eradicate it. Solid pseudopapillary neoplasm of the pancreas is a rare originating tumor with progesterone receptors. At the present time there are about four thousand cases described in the world’s literature. In our study we present 38 cases of SPN, and 37 of them underwent surgical treatment. We think that international society has to be formed to improve results of revealing, adequate surgical and therapeutic treatment of this tumor. Authors report no conflicts of interest. The authors alone are responsible for the content and writing of the paper. Frantz VK. Tumors of the pancreas. In: Bumberg CW, editor. Atlas of tumor pathology. VII. Fascicles 27 and 28. Washington: Armed Forced Institute of Pathology 1959; p. 32–39.